Back in September, Notre Dame and Michigan played one of the most entertaining games of the college football season. Rich Rodriguez (top right) and Michigan defeated the Charlie Weis (top left) and the Fighting Irish 34-31 as freshman quarterback Tate Forcier threw a touchdown pass late in the fourth quarter to give th Wolverines the win at Michigan Stadium. It would be the second of four straight wins to start the season for the Wolverines, while Notre Dame would win four of its first five games, with its only setback coming in that last second loss. Both programs appeared to be on the cusp of returning to prominence. But the two teams have combined for just three wins in their last 14 games combined. Michigan finished its season on Saturday by losing to arch-rival Ohio State 21-10, a loss that cost the Wolverines any chance of going to a bowl game, while Notre Dame lost to Connecticut at home on Saturday, the Irish’s third straight loss and likely the final nail in the coffin of Weis’ coaching career in South Bend. Grammatical errors and repetition issues aside (seriously, Rich, how about throwing in a “embarrassed” or “humiliated” into that rant instead of using the word “humbled” five times in 36 words? ), Rodriguez has a point. With the loss, the Wolverines finished tied for last in the Big Ten with Indiana, the only conference opponent Michigan managed to defeat the season. Forcier, who memorably bragged that he never gets nervous after beating the Irish, looked awfully shaky as he appeared to be suffering from his first ever case of nerves on Saturday. Forcier threw four interception and also fumbled in the end zone to hand the Buckeyes a touchdown early in the contest. 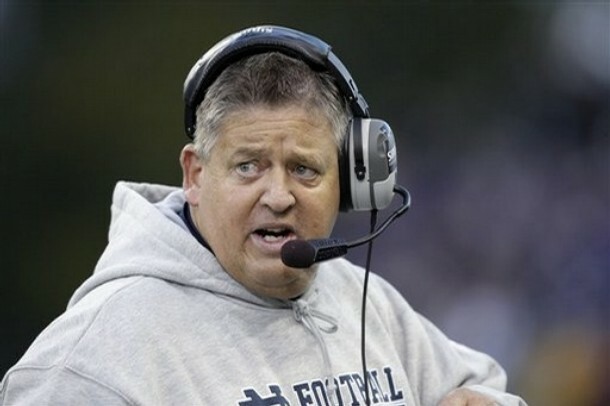 Notre Dame coach Charlie Weis will have a very good resume if and when he hits the job market this winter after the Fighting Irish wrap up their third consecutive mediocre-to-bad season in a few weeks. 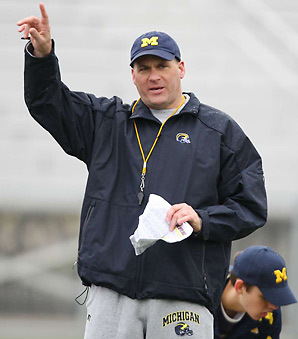 He was a member of the coaching staff on four Super Bowl winning teams (one as an offensive assistant with the New York Giants in 1990 and three as the offensive coordinator of the New England Patriots in 2001, 2003, and 2004). He also led the Fighting Irish, his alma mater, to major bowl games in his first two seasons in South Bend. 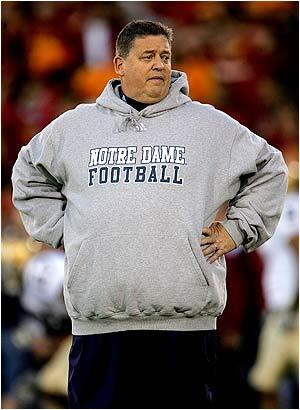 But time is running out on Charlie Weis. It went down quickly after Weis’s second year, as the Irish struggled to a 3-9 record in 2007, the school’s worst in its illustrious football history. In 2008, Notre Dame started the season 4-1, only to lose five of their last seven games and finish the regular season at 6-6, the epitome of mediocrity. This season, the Irish were returning a lot of talent and the talk around South Bend was that anything less than 10-2 and a trip to a Bowl Championship Series bowl game would be a major disappointment. Well, disappointment now reigns in northern Indiana as the Irish have struggled to a 6-4 record thus far this season after Saturday night’s loss against Pittsburgh. 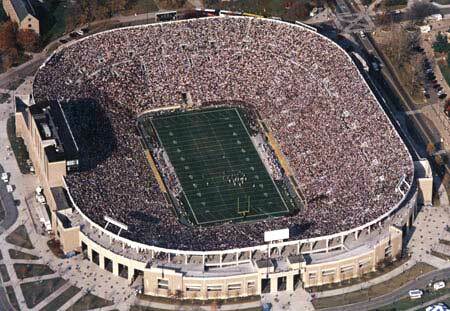 The Irish are already bowl eligible, and will be invited to a post season game no matter what they do. And that’s a good thing because Notre Dame plays Connecticut and suddenly resurgent Stanford in its final two contests. It is widely assumed that Weis will be fired either after the Stanford game or after the Irish play in a bowl game, which will bring to an end one of the oddest coaching careers in college football history. Midway through his first season at the helm at Notre Dame, Weis was given a 10-year extension to his contract to remain the Notre Dame coach, something Weis’s predecessor, Tyrone Willingham, was never offered despite going 8-0 to start his first campaign in South Bend. Weis bragged that his NFL pedigree would give the Irish a distinct tactical advantage every week when playing against college competition, but in the last three years, the Irish are just 16-19, have lost to Navy two of the last three seasons, and have never beaten USC in Weis’s tenure. We at A Casual Fan have a hard time rooting for anyone to lose a job. These coaches have families and the speculation must be hard on Weis’s assistant coaches, whose jobs are also tied to Weis’s success. But Charlie Weis, by accepting that extension and by boasting about his intellectual superiority in the realm of football, has made his own bed. He’ll probably land on his feet, becoming the offensive coordinator for some NFL team next season. But we’re willing to bet the house that he will not be back prowling the sidelines for his alma mater next season.